Measuring and control module for monitoring and automation of irradiation processes. Three programmable relays for automation of single- and multi-level irradiation processes. Input for one probe with pre-amplification or one photodiode. 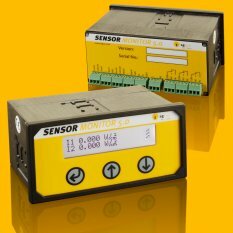 The Sensor Monitor 5.0 series are measurement and control modules for monitoring and automating of irradiation processes. They display radiation, dose and state information which is simultaneously provided via USB/RS232.